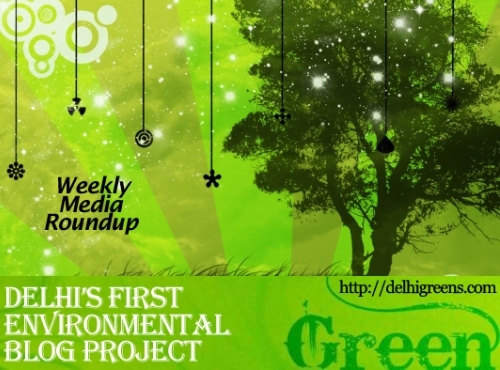 Weekly green news update from across different media networks for week 29 (between July 18 to 24) 2016. The National Green Tribunal has directed Delhi University to ensure that no paper in the form of posters, pamphlets used for camapigning on campuses are wasted during the DUSU elections due in September. In a bid to develop green areas and revamp big and small parks under its jurisdiction, the New Delhi Municipal Council has signed an agreement with National Environmental Engineering Research Institute to develop 12 sewage treatment plants. Buildings generating high levels of dust in Delhi and the national capital region on Wednesday came under the scanner of the National Green Tribunal which said that construction sites above 20,000 square metres will be fined Rs 5 lakh for causing dust pollution and flouting environmental norms. Over two months, parts of the service road on both sides of Ring Road running along GK-I Enclave, Pamposh Enclave and CR Park have caved in, and road-owning agency PWD is worried that a bigger accident is imminent. Two days after the National Green Tribunal directed the Regional Transport Office to immediately deregister all diesel vehicles in the capital older than 10 years, the tribunal said Wednesday that deregistration would be carried out in a phased manner and diesel vehicles which are at least 15 years old should be deregistered first. The New Delhi Municipal Council has identified 12 schools where decentralised sewage treatment plants (of varying sizes, depending on available areas) will be set up. Treated water from these plants will be used for horticulture in nearby green areas. Residents of a colony in South Delhi woke up to stinking streets on Tuesday morning, with a sewer line leaking and flooding the area. An expert committee constituted by the National Green Tribunal to assess the pollution load of drains prior to joining Yamuna has observed that all the drains have “bacteriological contamination”. The government termed as “inappropriate” the recent World Health Organisation (WHO) report which ranked several Indian cities, including Delhi, among top 20 most polluted ones globally, and said the data was based on “extrapolated and estimated values”. The National Green Tribunal on Tuesday issued show-cause notices to the District Magistrate and two other senior officials for the alleged indiscriminate dumping and burning of municipal solid waste in Ghaziabad. India on Saturday voiced concerns over lack of verifiable data on Hydrofluorocarbons which is critical for calculating the baseline and deciding upon a deadline to phase out the potent greenhouse gases.